The universally recognized signature of hospitality is the pineapple. How did this prickly yet sweet exotic fruit become the symbol of welcome? Christopher Columbus brought this unusual fruit back to Europe in 1493 after his travels through the Caribbean islands. Its popularity grew both in European circles and in the American colonies. 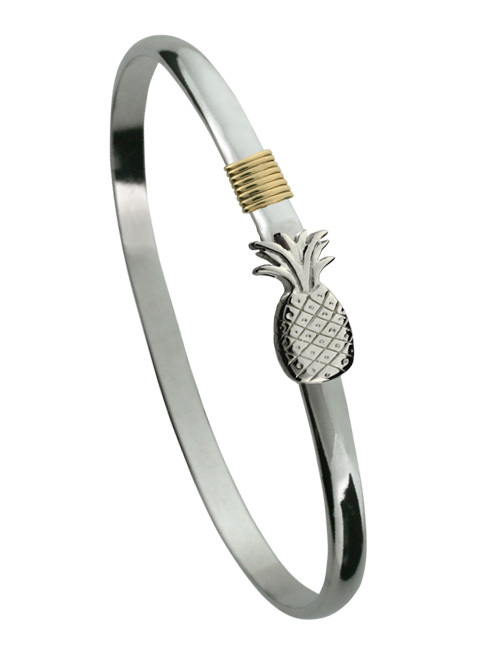 Since sweets and fresh fruit were rare, the pineapple became a coveted item of the wealthy and so will this stunning Pineapple Hook Bracelet in sterling silver with a sterling silver pineapple and 14K wrap.